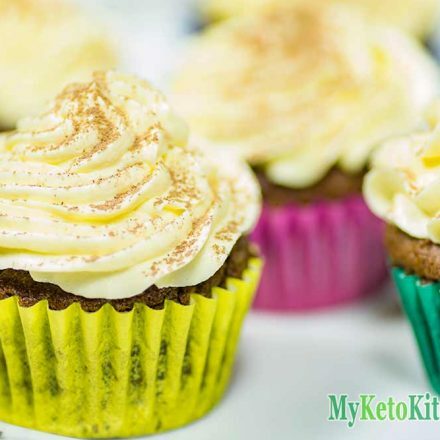 You’ll love this keto cupcakes recipe with low carb chocolate and cream flavor. These Keto cupcakes are beautifully light and fluffy, even after a few days in the fridge. The Chocolate Cupcake and Creamy Frosting compliment each other in perfect balance. We made 18 mini keto cupcakes out of our recipe. You could easily make larger cupcakes, ensuring to increase the cooking time to 14-18 minutes. 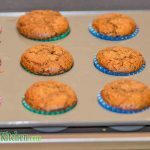 This Keto Cupcakes Recipe is not only low-carb and sugar free but they’re also gluten free and paleo friendly. An excellent snack or dessert. Preheat fan forced oven to 180C/350F. Place almond meal, cocoa powder, baking powder and natvia into a bowl and mix with a hand mixer on low speed until combined. In a separate bowl, mix maple syrup, heavy cream, eggs and melted butter. Add wet ingredients to the dry ingredients and mix on medium for 2 minutes, until well combined. Line a mini muffin tray (you can get the ones we use here) with cupcake papers and spoon cupcake mix into the papers until they are 3/4 full. This allows room for the cupcakes to rise. Bake in the oven for 10 to 12 minutes, until a skewer comes out clean when inserted into the center of a cupcake. Set on a wire rack to cool. Cut the butter into cubes and place into a bowl. Whip the butter on medium speed with a hand mixer for 3 minutes. Reduce the speed to low. Slowly add the Natvia icing mix, one spoonful at a time, as the icing mix is very light and will very quickly be spread over the kitchen if added all at once. After all the icing mix has been incorporated into the butter, add the heavy cream and continue to mix the frosting for a further 3 minutes. Stop the hand mixer and scrape down the sides of the bowl occasionally to ensure the frosting is thoroughly mixed. Spoon the frosting into a piping bag with a small star nozzle and pipe evenly over the cooled cupcakes. We highly recommend these disposable piping bags for hygienic single-use, and even easier clean up. Enjoy your Low Carb Chocolate Cream Cupcakes straight away or put them in the fridge if you like your icing a little firmer. We decorated ours with a little extra unsweetened cocoa powder. 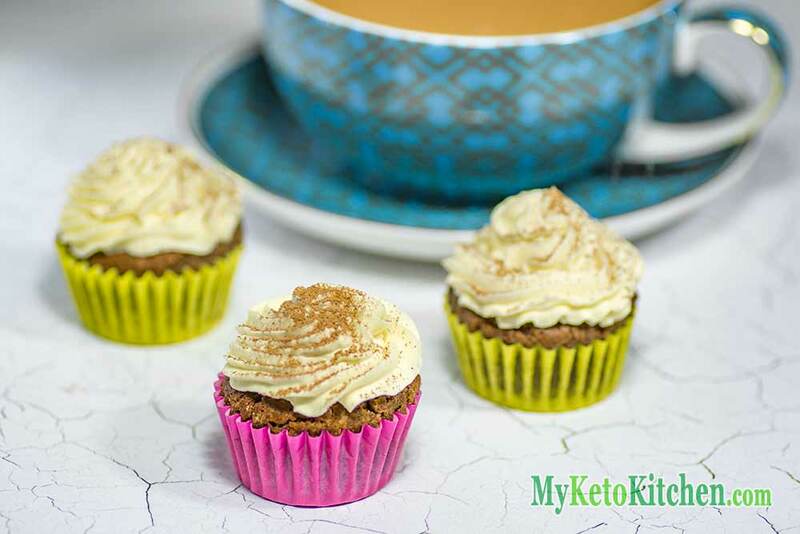 These Low Carb Chocolate Cream Keto Cupcakes are beautifully light and fluffy, even after a few days in the fridge. We can't get enough of these little keto treats! In a separate bowl, mix together maple syrup, heavy cream, eggs and melted butter. Line a mini muffin tray with cupcake papers and spoon cupcake mix into the papers until they are 3/4 full. This allows room for the cupcakes to rise. Spoon the frosting into a piping bag with a small star nozzle and pipe evenly over the cooled cupcakes. Enjoy Ultimate Low Carb Cupcakes straight away or put them in the fridge if you like your icing a little firmer. We decorated ours with a little extra unsweetened cocoa powder. 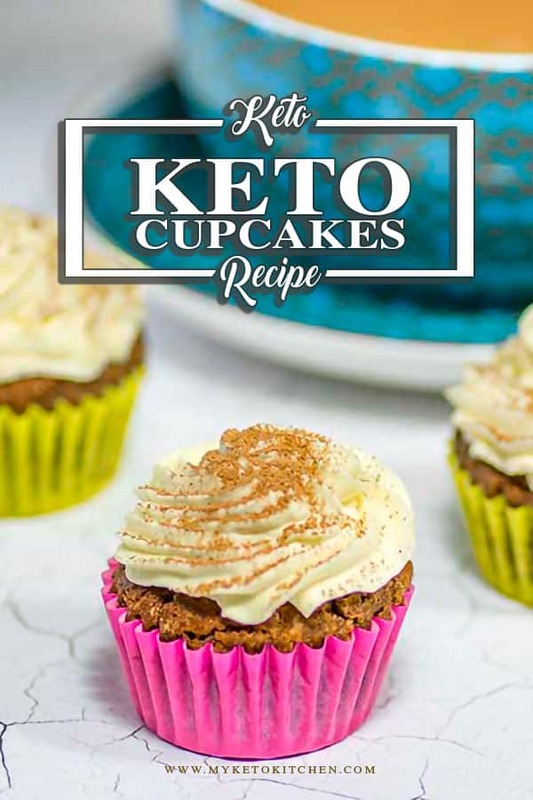 To make a larger batch of this keto cupcakes with low carb chocolate cream adjust the serving amounts in our the recipe card above.